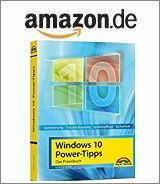 [German]Microsoft has released a firmware update for Surface Pro 3 at August 29, 2016. This update shall fix the battery degradation issue some users are facing after warranty is over. I’ve blogged about that issue a while ago in my article ‘Akku gate’: Surface Pro 3 and the “sudden” battery dead. Surface users sees the batteries degrades within weeks after the first year – just after the warranty is over. Microsoft announced that it’s probably possible to fix the problem with a software update (see Surface Pro 3 battery issue – a statement from Microsoft). Microsoft’s employee Greg has posted the following statement within the thread linked above. A limited number of Surface Pro 3 owners find that their battery can no longer hold a charge, and it looks like the battery capacity has diminished. With the power plugged in, the Surface Pro 3 is fine, but the battery will run out quickly once it’s not being charged. The firmware update, also listed at the Surface-Firmware-Update-History page addresses the battery issue. Surface Pro Embedded Controller Firmware: v38.10.90.0 corrects an error that may occur on a limited number of Surface Pro 3 devices where the full charge capacity of the battery is misreported to the operating system and device firmware. This update corrects the firmware component that functions as a “fuel gauge” so that the battery capacity is accurately reported. 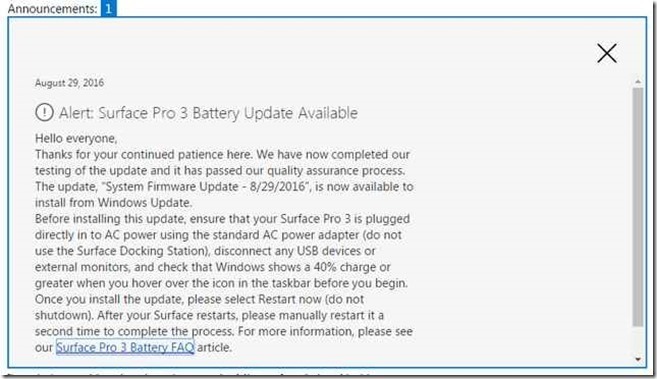 See Surface Pro 3 Battery FAQ for the 8/29/2016 System Firmware Update for more information. Visiting this US-Microsoft Answers forum thead shows a popup notification about the new fix. The firmware update is rolled out via Windows Update for Windows 8.1 Update 1 and for Windows 10. More details may be found on this web site. Important: Make sure your Surface Pro 3 is plugged directly into AC power using the standard AC power adapter during update install. Do not use the Surface Docking Station. Disconnect any USB devices or external monitors, and check that Windows shows a 40% charge or greater when you hover over the icon in the taskbar. After the update has been applied, the Surface Pro 3 will boot back into Windows. At this point, the user needs to do another restart for the new battery logic to take effect, as Microsoft noted. Browsing through this Microsoft Answers forum thread shows, that some users are running into new issues. Some users won’t see the new firmware updates at all. Others are reporting, that installing this firmware update did not help. The new load balance calibration won’t start. One user is reporting that the following procedure has helped. 1. Unplug the surface and let it sit for a few hours. 2. Plug it in and then start it up. 3. As soon as you see the surface screen Unplug the cord and quickly plug it back in. Leave it plugged and it should trick the firmware in to charging again, or at least running off AC power enough to log in. Another user reported his battery report after installing the update. His battery capacity has been reported sinc Jule 2016 as 144 mWh. The battery capacity should be 42,157 mWh . Some users are reporting that the Surface Pro 3 stalls after removing the AC power charger. It seems there is room for further improvements. Fix for Surface Pro 3 battery degradation? This entry was posted in computer, Update and tagged battery, Firmware-Updae, urface Pro 3. Bookmark the permalink.